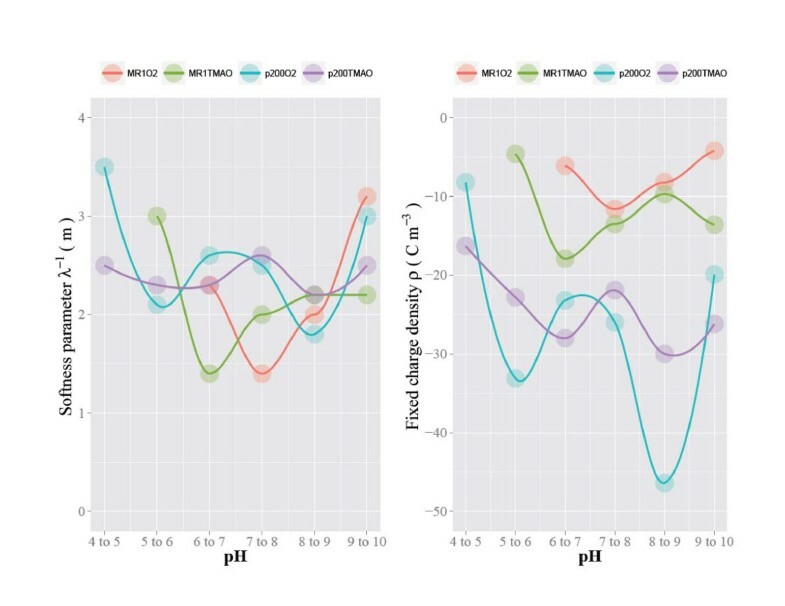 We investigated the surface characteristics of two strains of Shewanella sp., S. oneidensis MR-1 and S. putrefaciens 200, that were grown under aerobic conditions as well as under anaerobic conditions with trimethylamine oxide (TMAO) as the electron acceptor. The investigation focused on the experimental determination of electrophoretic mobility (EPM) under a range of pH and ionic strength, as well as by subsequent modeling in which Shewanella cells were considered to be soft particles with water- and ion-permeable outermost layers. The soft layer of p200 is significantly more highly charged (i.e., more negative) than that of MR-1. The effect of electron acceptor on the soft particle characteristics of Shewanella sp. is complex. The fixed charge density, which is a measure of the deionized and deprotonated functional groups in the soft layer polymers, is slightly greater (i.e., more negative) for aerobically grown p200 than for p200 grown with TMAO. On the other hand, the fixed charge density of aerobically grown MR1 is slightly less than that of p200 grown with TMAO. The effect of pH on the soft particle characteristics is also complex, and does not exhibit a clear pH-dependent trend. The Shewanella surface characteristics were attributed to the nature of the outermost soft layer, the extracellular polymeric substances (EPS) in case of p200 and lypopolysaccharides (LPS) in case of MR1 which generally lacks EPS. The growth conditions (i.e., aerobic vs. anaerobic TMAO) have an influence on the soft layer characteristics of Shewanella sp. cells. Meanwhile, the clear pH dependency of the mechanical and morphological characteristics of EPS and LPS layers, observed in previous studies through atomic force microscopy, adhesion tests and spectroscopies, cannot be corroborated by the electrohydrodynamics-based soft particle characteristics which does not exhibited a clear pH dependency in this study. While the electrohydrodynamics-based soft-particle model is a useful tool in understanding bacteria’s surface properties, it needs to be supplemented with other characterization methods and models (e.g., chemical and micromechanical) in order to comprehensively address all of the surface-related characteristics important in environmental and other aqueous processes. The surface electrochemical structures of microbial cells in aqueous suspension affect a large variety of environmentally significant interfacial processes, such as biofouling, corrosion, colloid flocculation, and sorption of contaminants. For example, the biofouling of reverse osmosis membrane can be predicted by the surface electrochemical properties of the microbes . The transport behavior of Escherichia coli isolates through porous media depends on the bacteria’s surface electrochemical and physical properties . The contaminant sorption on bacteria occurs primarily on the cell walls and extracellular polymeric substances (EPS) whose electrochemical and molecular properties in turn determine the sorption mechanisms and magnitudes [3, 4]. In addition, the interaction between microbial cells, EPS and surrounding environment are important in coastal sediment stabilization, nutrient scavenging, biofilm stabilization due to gene transfer, and carbon cycling [5–14]. Electrokinetic measurements (i.e., electrophoresis) are often used to characterize the surface electrochemical structure of colloidal particles in aqueous suspension. For colloidal particles with impermeable surfaces, such as latex and mineral particles, electrophoretic mobility (EPM) data can readily yield a quantitative description of the surface electrochemical structure using the electric double layer (EDL) model framework . In the EDL model, a negatively (or positively) charged mineral surface is surrounded by a layer of electrostatically attracted cations (or anions) as the counter ions. Further, this inner layer is surrounded by a so-called diffuse layer, which differs from the electrically neutral bulk aqueous solution in that it is locally enriched with cations (or anions) while depleted with anions (or cations) due to the long-range electrostatic interaction with the mineral surface. For rigid particles, careful analyses of EPM data can yield the electrical potential at the surface (or zeta potential at the slip plane as its empirical proxy), as well as the attenuation of the potential within EDL. A quantitative understanding of the surface electrochemical structure allows a quantitative and predictive understanding of flocculation, transport, and sorptive properties of the colloidal particles in aqueous suspension by employing the DLVO theory (Derjaguin and Landau , Verwey and Overbeek ) [18–20]. However, soft particles, i.e., particles with water- and ion-permeable surface layers (i.e., “soft layers”), do not allow such a straight-forward interpretation of the electrokinetic data [21, 22]. The bulk behavior of suspended soft particles, such as flocculation, cannot always be predicted from the electrokinetic data alone . The EPM of a soft particle depends on the attenuation of electrical potential in the vicinity of the surface, which in turn depends not only on the properties of host aqueous solution but also on the water and ion permeability of the soft layer. 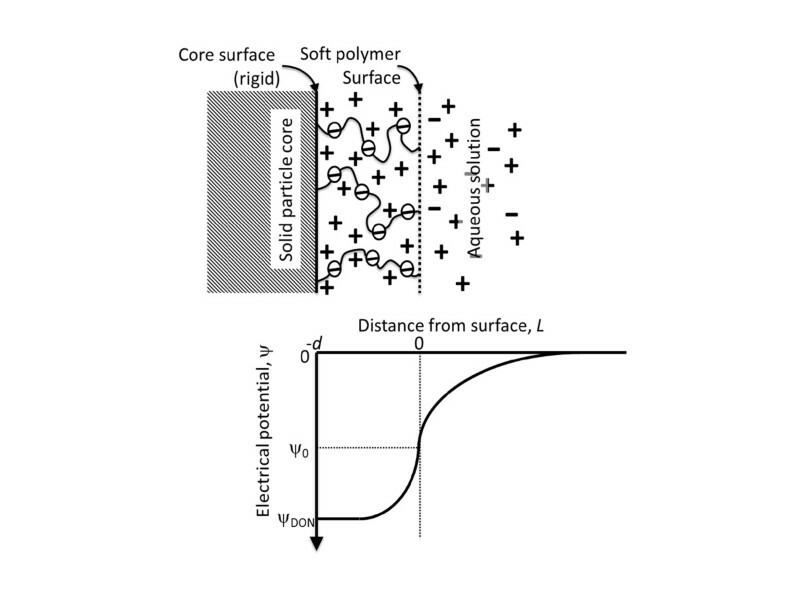 Ohshima has developed a model in which experimentally measured EPM can be correlated to key parameters that describe the surface electrochemical structures of soft particles, i.e., Donnan potential, surface potential, fixed charge density and softness parameter (Figure 1) [22, 24]. Ion and charge distribution and electrical potential attenuation across a surface soft layer of thickness d containing negatively charged (deprotonated) functional groups. The Donnan potential, ψDON, represents the potential at the rigid surface of the particle (L = −d), whereas the surface potential, ψ0, is the potential at the soft particle surface (L = 0). The fixed charge density, ρfix, represents the charge density within the soft polymer layer that arises from the deprotonated functional groups of the polymer segment. The softness parameter, 1/λ, is a relative measure of the ease of water flow within the soft later. After Ohshima . Microbial cells may be considered using the soft particle model. The cell wall of gram-negative bacteria consists of an outer membrane containing lipopolysaccharides (LPS), as well as a gel-like periplasm with a thin peptidoglycan layer. These outer membrane components are permeable to water molecules and ions. In addition, the extracellular polymeric substances (EPS), often produced by microorganisms, are also permeable. Recently, the EPM data of Shewanella sp. and other bacteria have been evaluated using Ohshima’s soft particle model [25–28]. The effect of ionic strength on the soft particle properties of Shewanella sp. has been found to be quantitatively significant in S. putrefaciens CN32, which is surrounded by a thin, charged envelope, while it was found to be less pronounced in S. oneidensis MR-4, which is surrounded by a thick gel-like layer . Shewanella sp. has been extensively studied as a model microorganism due to its ubiquitous presence in a wide range of natural and engineered environments, respiratory versatility and ease of genetic manipulation [30–32]. Its ability to conduct dissimilatory metal reduction has been exploited for potential applications in the bioremediation of metal and organic contaminants . A better understanding of the Shewanella sp. surfaces in terms of their electrochemical structures and consequential flocculation, transport and sorptive properties would enable: (i) a further interpretation of the existing Shewanella sp. knowledge base; and (ii) better guiding of the future designs for bioremediation applications utilizing Shewanella sp. and other similar microorganisms. Previous studies have found that pH has a quantitatively significant influence on the mechanical and morphological properties of the biopolymers that surround Shewanella sp. cells [34–36]. The cell surface soft particle properties have been found to differ between cells grown with TMAO and with fumarate/nitrate as electron acceptors . The objective of this study is to investigate the effect of pH and electron acceptors (O2 vs. trimethylamine oxide (TMAO)) on the soft particle properties of EPS-poor and EPS-rich gram negative bacteria, Shewanella oneidensis MR-1 and S. putrefaciens 200, respectively. Shewanella oneidensis MR-1 (ATCC 7005500) (herein referred to as MR1) and Shewanella putrefaciens 200 (ATCC 51753) (herein referred to as p200) stock cultures were maintained in Luria-Bertani medium with 20% glycerol at −80°C and were routinely grown in LB medium at 30°C for 15 h on a rotary shaker (150 r.p.m.). Water for all experiments was supplied from a Millipore (Direct-Q 5) ultrapure water system. EPS was produced in cultures containing 1 L modified M1 medium containing 3.0 mM PIPES, 7.50 mM NaOH, 28.04 mM NH4Cl, 1.34 mM KCl, 4.35 mM NaH2PO4 and 0.70 mM CaCl2 supplemented with trace amounts of minerals, vitamins and amino acids [37, 38]. Thirty mM Na-lactate was added as electron donor and 30 mM trimethylamine oxide (TMAO) was added as electron acceptor in anaerobic cultures. Air or N2 was bubbled through the medium to maintain aerobic or anaerobic growth conditions, respectively. Cultures were inoculated (OD600 = 0.1) and grown to late exponential phase (24 h). Dague and colleagues have shown that the EPM of Shewanella cells does not vary appreciably between cells harvested at different growth periods (midexponential vs. pseudostationary) . Laser Doppler velocimetry (LDV) analysis was used to determine the EPM of MR1 grown under either oxygen or TMAO as electron donors (referred as MR1O2 and MR1TMAO) and p200 grown under either oxygen or TMAO as electron donors (referred as p200O2 and p200TMAO) under a range of ionic strength (20 ≲ I ≲ 200 mol m-3) and pH (2 ≲ pH ≲ 12). The analysis was conducted using the Malvern Zetasizer nano-ZS at 25°C. Approximately 10 ml of each bacteria suspension sample, with prescribed adjustments to ionic strength using KCl, a monovalent electrolyte, was loaded into a sample reservoir, from which a small aliquot (~ 1 mL) was introduced to the LDV capillary chamber with embedded electrodes. Suspended cells, whose surface was charged either positively or negatively depending on the pH, moved towards the electrode of the opposite charge when the potential was applied, and their average velocity was measured. By knowing the physical properties of the suspension medium, the velocity was converted to EPM . The LDV techniques have been previously used to characterize the EPM of various naturally-derived colloids including bacterial cells and EPS . For each series of analysis, the ionic strength was held approximately constant whereas pH was varied by titrating the reservoir sample with the addition of 0.1 N HCl or 0.1 N NaOH. After each pH adjustment monitored by a combination pH electrode, the reservoir suspension was homogenized with a magnetic stirrer before a ~ 1 mL aliquot was introduced to the LDV capillary chamber. After the analysis, the aliquot was returned back to the reservoir, homogenized with the rest of the reservoir sample, and a small fraction was introduced to the capillary chamber again for an additional analysis. The analysis was conducted three times for each pH value. Once in the capillary chamber, the conductivity of the suspension solution was determined along with the EPM. The conductivity was later converted to ionic strength. The conductivity (and thus ionic strength) varied slightly during each titration series due to the NaOH or HCl addition. where k is the Boltzmann constant, T is the absolute temperature, z and n∞ are the valence and number concentration of the dissolved electrolyte in the bulk aqueous solution, and κ is the reciprocal of the Debye length k − 1 = ε r ε 0 kT 2 e 2 zn∞ , in monovalent electrolyte solution. Ohshima’s soft particle model assumes that the soft layer is homogeneous in terms of the permeability and charge distribution. However, soft layers of natural bacteria may be considered as diffuse . Recent studies have shown that a more rigorous treatment of the charge and permeability distributions within the soft layers using a step function or numerical solution can successfully depict the heterogeneity [21, 41]. However, Ohshima  has shown that the effect of inhomogeneity within soft layer becomes insignificant at moderate to high ionic strength. Recent soft-particle analyses of Shewanella sp. show that errors due to the homogeneity assumption are small when I ≳ 0.02 (M) . A similar result was also observed with Pseudomonas sp. Consequently, our study utilized EPM data that were obtained at 0.02 ≲ I (M). Ohshima’s model also assumes that the particle size is much greater than the Debye length and thus the particle surface is approximated to be planer [24, 41]. The Debye length at I ≥ 0.02 (M) is κ-1 ≤ 2.1 (nm) while a typical size of S. sp. cells is several hundred nanometers in width and a few thousand nanometers in length (e.g., ). Consequently, the planer assumption is valid when the EPM data obtained at 0.02 ≲ I (M) are considered. By substituting Equations (4) – (6) in (1), it is evident that the EPM can be expressed with just two of the key parameters, fixed charge density, ρfix, and electrophoretic softness, λ-1, under given ionic strength values (which is linearly related to n∞). An optimization scheme (i.e., the lsqnonlin routine on Matlab®) was used with the EPM data obtained at 0.02 ≲ I ≲ 0.15 (M) and at pH values within discrete ranges in order to determine the best ρfix and λ-1 values for each of the four systems at given pH ranges. In order to eliminate false results due to local minima, the optimization routine was run 100 times using different, randomly generated initial guess values for ρfix and λ-1. The experimentally determined EPM values are plotted in Figures 2 and 3 (pH vs. EPM) and Figure 4 (ionic strength vs. EPM). The results indicate that the EPM is greater in magnitude (i.e., more negative) for the EPS-rich p200 than for EPS-poor MR1 regardless of the electron acceptors. This is in contrast to a previous study in which the cell walls had greater charge density than the EPS . However, another study revealed that the difference between the relative charge between EPS and cell walls is species- and strain-dependent . Consequently, the results obtained here are specific to p200 and MR1, and are not applicable in comparing the cell walls and EPS of other microorganisms. Experimentally determined EPMs are plotted against pH. The average from each triplicate measurement is reported, along with the standard deviation shown as error bars. 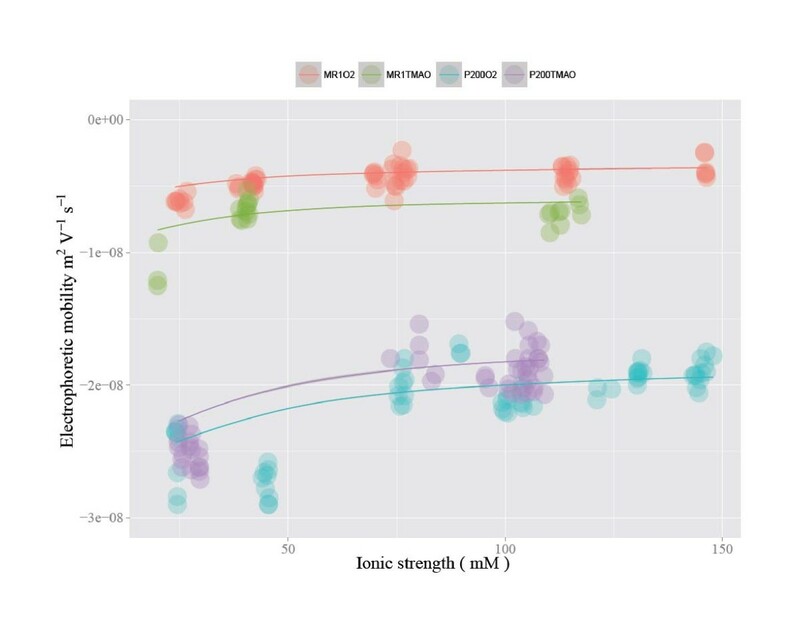 Results from all ionic strength values are shown together on this figure. Experimentally determined EPMs are plotted against pH. Results from three discrete ionic strength ranges are shown in each panel using different colors. Experimentally determined EPMs are plotted against ionic strength. Results from four discrete pH ranges are shown in each panel using different colors. The isoelectric point (iep) for each system was determined to be iepMR1O2 = 3.2, iepMR1TMAO = 3.8, iepp200O2 = 2.8, and iepp200TMAO = 2.6. These iep estimates assumed that the specific ion adsorption was negligible in these systems and thus iep is independent of ionic strength. A recent study has shown that the MR1 surfaces are associated with a patchy presence of EPS while the p200 surface has a more extensive EPS coverage [26, 45]. The dependence of EPM on ionic strength is more pronounced for the EPS-rich p200 than for EPS-poor MR1 at all pH values examined (e.g., Figure 4). This is in contrast to a previous study in which the EPM of gram-positive Bacillus licheniformis S-86 exhibited an increased ionic strength dependency when its EPS was removed . The reason for this contrast is unknown. However, we could speculate that, in the absence of EPS, the LPS layer, which is unique to gram-positive bacteria, has significantly different electrohydrodynamic properties compared to the peptidoglycan, which is the outermost layer of gram-positive bacterial cells. The measured EPM data were fit to Ohshima’s soft particle model (Equation (1)) with λ−1 and ρfix as the parameters to be optimized. The fitting was conducted using the data points from 0.02 ≲ I ≲ 0.15 (M) and discrete pH value ranges in conjunction with the lsqnonlin routine in Matlab®. It should be noted that each of the triplicate measurements at a given pH and ionic strength was treated as a separate data point for the model fitting. Table 1 reports the optimized λ−1 and ρfix value pairs for each sample series at each discrete pH ranges. Figure 5 illustrates an example of the best-fit EPM function (i.e., calculated curve for Equation (1) with the optimized λ−1 and ρfix values) for each sample series obtained from the pH range of 6 ≲ pH ≲ 9. Experimentally measured EPMs for 6 ≲ pH ≲ 9 are plotted as a function of ionic strength. In addition, the optimized EPM function (Equation (1) calculated using the optimized λ-1 and ρ value pairs) are shown as lines. The optimized λ-1 and ρ value pairs used to calculate the best-fit EPM function lines are reported in Table 1. The pH values below pH 4 were not considered as the EPM measurements in the vicinity of iep (i.e., pH ≈ 3) were unstable. 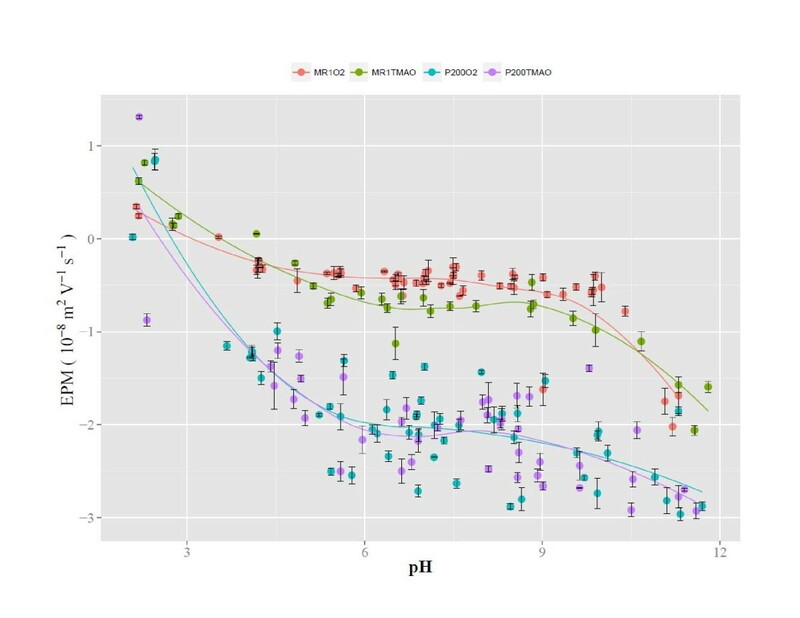 The pH values above pH 10 were not considered because there was a significant EPM data scatter in that pH region which made the regression optimization unreliable. The scatter may be due to the heterogeneity of the physiological response of Shewanella species to increased pH . Even though both MR1 and p200 exhibit EPM data profiles that are typical of soft particles (e.g., Figures 2, 3, 4), they differ in the magnitudes of soft particle characteristics. 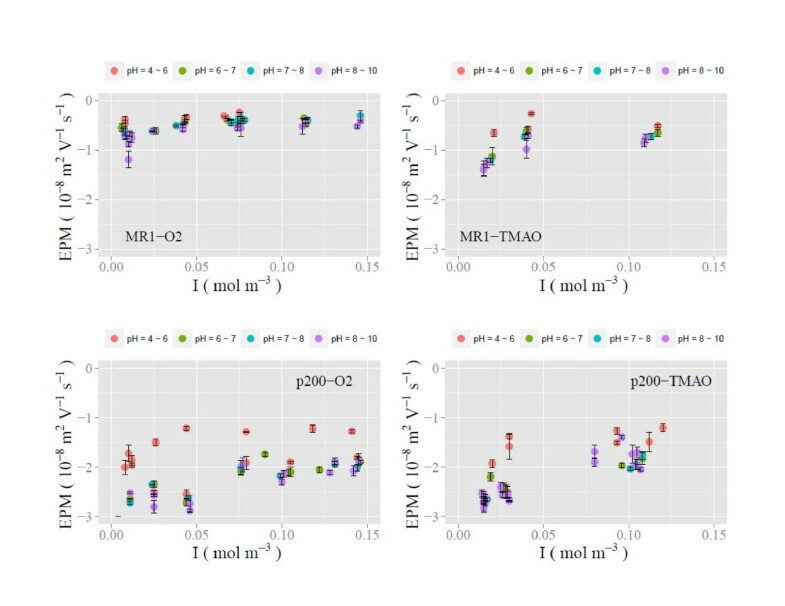 In our study, the difference in softness parameter between MR1O2, MR1TMAO, P200O2 and P200TMAO were relatively small for the entire pH range investigated (Figure 6). The softness parameter values fell between 1.4 and 3.5 which indicates the presence of a surface layer with a finite permeability value. For comparison, this range is in line with the softness parameter values calculated in the previous studies of various Shewanella sp. cultures (e.g., λ−1 = 2 – 3.6 (× 10-9 m) at pH = 7 for S. oneidensis MR-4 and CN32 [25, 29]; λ−1 = 4 (× 10-9 m) at pH = 4 – 10 for S. putrefaciens CIP 80.40  and λ−1 = 0.4 – 3 (× 10-9 m) at pH = 5.5 – 5.8 for MR1 and p200 grown with TMAO, fumarate and nitrate ). On the other hand, our study found that there is a clear difference in the fixed charge density between MR1 and p200. The fixed charge density of MR1 was found to vary between −4 and −18 (× 105 C m-3) (compared to ρ = ~ − 8 (× 105 C m-3) for MR1 grown with fumarate, nitrate or TMAO in a previous study ). Meanwhile, it was significantly greater for p200 with the values between −8 and −46 (C m-3) (compared to ρ = −21 (× 105 C m-3) for p200 grown with TMAO and ρ = −43 (× 105 C m-3) for p200 grown with fumarate/nitrate in a previous study ). 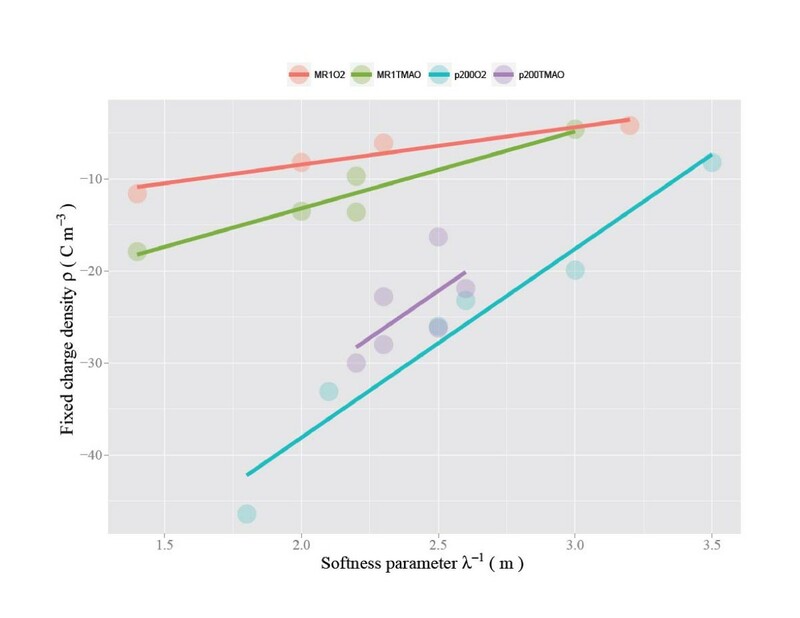 The softness parameter and fixed charge density values calculated by fitting Ohshima’s soft particle model (Equation (1) while adjusting the softness parameter and fixed charge density values to achieve the best fit. The model calculation was conducted separately for each of the discrete pH ranges. The actual values are shown in Table 1. The relationship between model-calculated softness parameter and fixed charge density (Figure 7) has clear trends that can be summarized by: (i) the inverse relationship between λ−1 and ρfix (i.e., increased softness parameter is met with less negative fixed charge density); and (ii) more pronounced correlation between λ−1 and ρfix in the EPS-rich p200 than in EPS-poor MR1 (i.e., a greater λ−1/ρfix slope for p200 than for MR1). The former trend is intuitively apparent. The expansion of the polymer segments leads to more permeable soft layers (i.e., a greater softness parameter) while reducing the number of available ion exchangeable sites per a unit volume (i.e., a decreased fixed charge density). However, it should be noted that there is no clear pH- or electron acceptor-related trend for the polymer expansion and contraction (see below). The latter implies that the materials (polymers) that make up the EPS have more cation exchangeable sites per unit length than the materials that make up the LPS. Relationship between softness parameter and fixed charge density that were determined by fitting Ohshima’s soft particle model (Equation (1)) while adjusting the softness parameter and fixed charge density values to achieve the best fit. The values are shown in Table 1. The complex effect of different electron acceptors (i.e., oxygen and TMAO) on Shewanella’s surface electrohydrodynamic properties can be seen in the relationship between softness and fixed charge density (Figure 7). A recent study has found that both MR1 and p200 exhibit significantly enhanced electrophoretic softness when grown with TMAO than with nitrate or fumarate . The same study also found that the fixed charge density of TAMO-grown p200 is far less negative than nitrate/fumarate-grown p200 . Our study, on the other hand, reveals that the difference between TMAO- and O2-grown cells is less straightforward. In our study, TMAO resulted in the decreased (i.e., less negative) fixed charge density over O2 for p200 while it resulted in the increased (i.e., more negative) fixed charge density over O2 for MR1. However, for both cases, the difference is small (Figure 7). The effect of pH on Shewanella’s surface electrohydrodynamic properties was found to be very complex (Figure 6). Generally speaking, the effect of pH on the surface surrounded by biopolymers is two-fold: (i) on one hand, a pH increase causes deprotonation of ionizable functional groups in the biopolymers which would result in increased (i.e., more negative) fixed charge density [40, 46]; (ii) on the other hand, the increased pH and functional group deprotonation lead to electrostatic repulsion between the negatively-charged ligands as well as polymer segments, and a consequential volume expansion in the biopolymer volume and decreased (less negative) fixed charge density [35, 40]. In our study, the fixed charge density does not have a clear dependency on pH. There may be a slight tendency for more permeable soft layer (i.e., high λ-1) at extreme low and high pH values while less permeable soft layer (i.e., low λ-1) at circumneutral pH values. 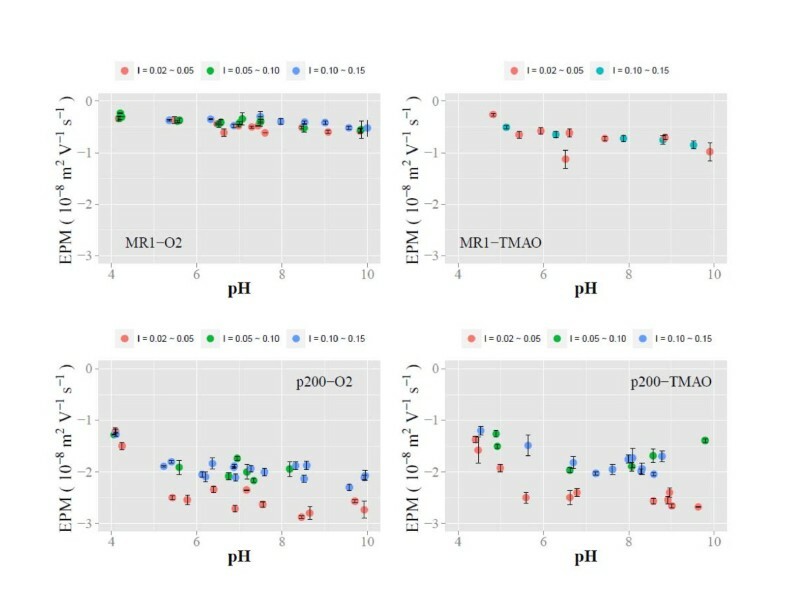 It is likely that the effect of pH on the soft particle properties of MR1 and p200 results from a complex interplay between the above (i) and (ii) as well as the physiological and chemical responses of Shewanella cells to different pH values. Studies have shown that the morphological and mechanical properties of the outermost soft layers of bacteria cells, including Shewanella sp., change in response to pH changes . An ATR-FTIR spectroscopy study revealed that EPS-poor S. CN32 (may be analogous to MR1 in our study) changes the chemical properties of its LPS functional groups with pH driven by protonation and deprotonation . The LPS and EPS layers of S. putrefaciens CIP 80.40 (may be analogous to p200 in our study) increase their volume and permeability with increasing pH, as investigated by atomic force microscopy and microbial adhesion tests . However, these linear or semi-linear correlation between pH and morphological/mechanical/chemical properties in EPS and LPS layers are not reflected in the soft particle parameters derived from Ohshima’s electrohydrodynamic soft particle theory  for our study. The pH dependency observed in our study is, for the most part, variable and nonlinear. This suggests that, while the electrohydrodynamics-based soft-particle model is a useful tool in investigating bacteria’s aqueous aggregation behavior and other behaviors controlled by the surface processes, it may be inadequate in comprehensively addressing the surface characteristics including the chemical and micromechanical characteristics. The comprehensive characterization of the bacterial cell surfaces would require the employment of multiple analytical techniques, including electrohydrodynamic, micromechanical, and chemical techniques. The Shewanella surface characteristics were attributed to the nature of the outermost soft layer, the extracellular polymeric substances (EPS) in case of the EPS-rich p200 and the cell wall lypopolysaccharides (LPS) in case of the EPS-poor MR1. The growth conditions (i.e., aerobic vs. anaerobic TMAO) have an influence on the soft layer characteristics of Shewanella sp. cells. Meanwhile, the clear pH dependency of the mechanical and morphological characteristics of EPS and LPS layers, observed in previous studies through atomic force microscopy, adhesion tests and spectroscopies, cannot be corroborated by the electrohydrodynamics-based soft particle characteristics which do not exhibited a clear pH dependency in this study. While the electrohydrodynamics-based soft-particle model is a useful tool in understanding bacteria’s surface properties, it needs to be supplemented with other characterization methods and models (e.g., chemical and micromechanical) in order to comprehensively address all of the surface-related characteristics important in environmental and other aqueous processes. This study was funded by the Office of Naval Research through base funding of the Naval Research Laboratory. NRL Contribution Number JA-7430-12-13. JRD prepared Shewanella cells, carried out EPM experiments and helped to draft the manuscript. YF carried out soft particle modeling and model optimization, interpreted the results and drafted the manuscript. All authors read and approved the final manuscript.